There are several different types of ad formats available from Snapchat, including Snap Ads, Sponsored Lenses, and Sponsored Geofilters. 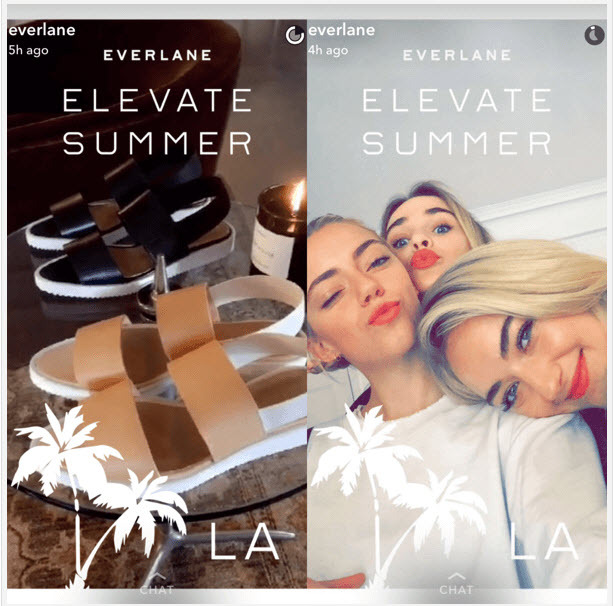 In two posts we’ll be taking a deep-dive into Sponsored On-demand Geofilters as they are arguably one of the easiest and most accessible Snapchat ad formats to get started with. They don’t require huge budgets and are ideal for your first venture into self-service Snapchat advertising! In this first post we’ll look at different ways of using Geofilters. In the second part we will tell you how to create a Snapchat Geofilter for your business! Geo filters are location specific overlays that users can choose to add to their snaps (pictures) after they have taken them. They are different from normal Snapchat lenses because lenses are dynamic animations and react to movement, whereas filters are static images that are added to static photographs. Some of the lenses you may have seen include things like having a rainbow come out of your mouth, where as a filter is much more straight forward and usually only take up the top, bottom, or sides of the snap and fit around the image. The other key difference is that Geofilters are specific to a location (as the name suggests! ), whereas filters are not. Community Geofilters which are free and for Artists and designers to submit Geofilters to run in their city or local landmark. This type of filter can’t be used by businesses or include business or organisation logos. As a business you’ll use On-Demand Geofilters, and this is the type of Geofilter which I’ll guide you through creating in this blog post. When should you use Snapchat Geofilters? Geofilters are great for branding in-and-around the physical presence of your business or event. They are all about brand awareness and do not promote specific URLs or send traffic to your website which makes it difficult to accurately attribute sales to them. If you’re running a company event you could create a Geofilter specifically for the event and promote it at your event to get attendees using it and taking pictures. These type of filters could run for a single day or however long the event takes place. 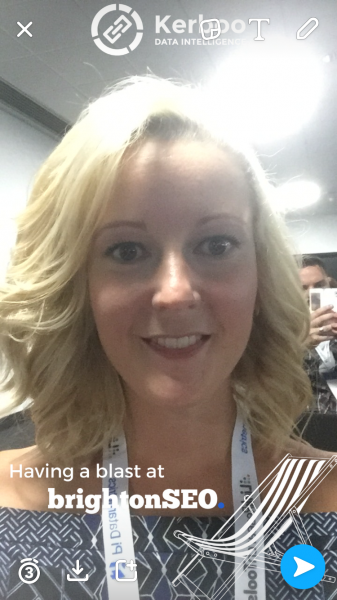 Trade shows are the perfect opportunity to use Geofilters (providing the audience of the show are Snapchat users!). For example London Fashion Week would be a great place for new and emerging fashion brands to promote their brand via a custom Geofilter. Be aware that if you’re attending a particular popular trade show other companies may have already submitted a filter to use and Snapchat generally won’t allow more than 7 filters per location. Are you having a special sale event or product launch at your business? This could be a great time to incorporate Geofilters. For example, when the Topshop sale launches they could create a Topshop branded Geofilter to run within the locations of all their flagship high stores with high footfall. If your employees are active Snapchat users and you have a large office you could create a Snapchat Geofilter for use within your office. This is a great way to promote your company culture and help with recruitment drives by publicising your company to potential candidates in the area via your existing employees. The key for deciding on how to use Geofilters is to think closely about your audience and how and if they would use the filter. If you are going to have a large footfall in the area then the impact of the Geofilter will be great as you’ll gain lots of exposure. If you have lower footfall levels then consider who the audience is that will be using it. If they have large followings on Snapchat then it’ll be a great success (for example at an influencer event). If your target audience are not normal Snapchat demographic users than your filter might be wasted on them. When you create the filter you will see different prices as you adjust the size, location and length of time you are planning to run the filter for. You can then pic a location and duration that suit your budget and campaign objectives. 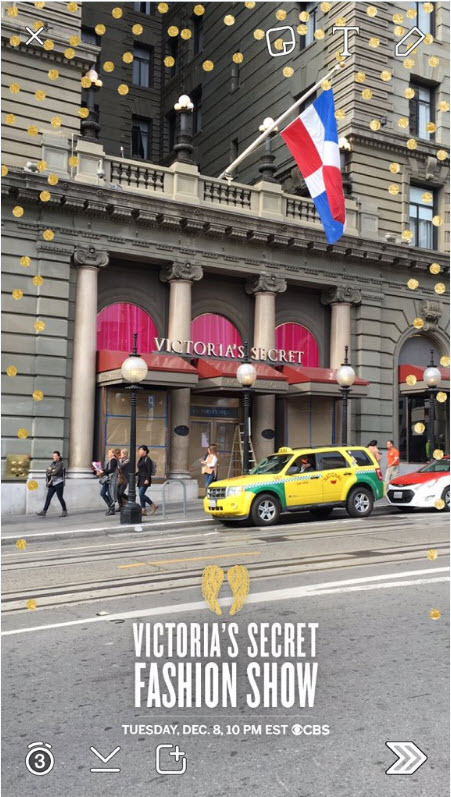 I have experienced Geofilters costing as little as $300 for 30 days in less popular locations such as offices, although Snapchat say their filters start for as little as $4.99. When considering the value and cost of a Geofilter you should take into account that someone using your Geofilter is much more valuable and engaging than someone simply viewing a banner ad. Likewise people receiving snaps using your filter are also much more valuable for branding than standard banner ads because the user is receiving the image from a friend or person they follow rather than being bombarded with them in other traditional advertising locations online.